With St. Patrick’s Day upon us next week, it is time to delve into horror that isn’t about falling face-first into a pool of your own green-beer enticed vomit. Instead, we will be breaking down horror movies based on the Irish. We begin with the beginning of a Leprechaun marathon. My apologies. Plot: A leprechaun goes on a rampage in order to get back his pot… I mean, bag of gold. Killer: An evil Leprechaun. Or is it, Mr. Leprechaun? Or should we just call it, “Warwick Davis gone crazy when he can’t book a casting after Willow“? Any way you look at it, it works. Critique: If you want to rate Leprechaun based on film technique, plot, suspense, true horror, and comedy, the film is not very good. To be brutally honest, it fails all of those criteria. The story limps along about an evil leprechaun terrorizing people in order to get back his pot, or in this case bag, of gold with more plot-hole and “WTF! ?” moments than the Converse sneakers I was wearing when this movie came out. 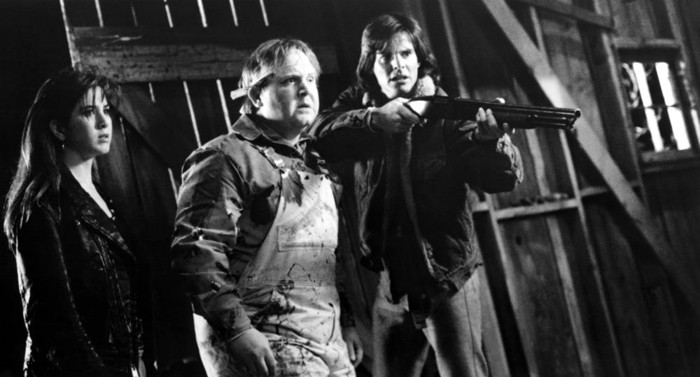 The kills in the movie are bland, save one, and way too few and far between by horror film standards. The movie isn’t scary in the slightest. The comedy is awkward at best. The probability that this movie held the last product placement for L.A. Gear was apparent. 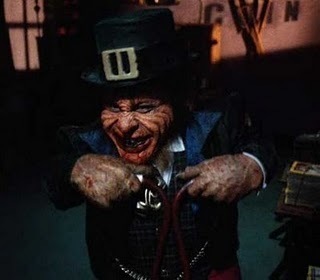 And yet, with all its problems, I love Leprechaun every time I see it because, when it comes to being entertaining, it succeeds where lesser films that take themselves too seriously continually fail. 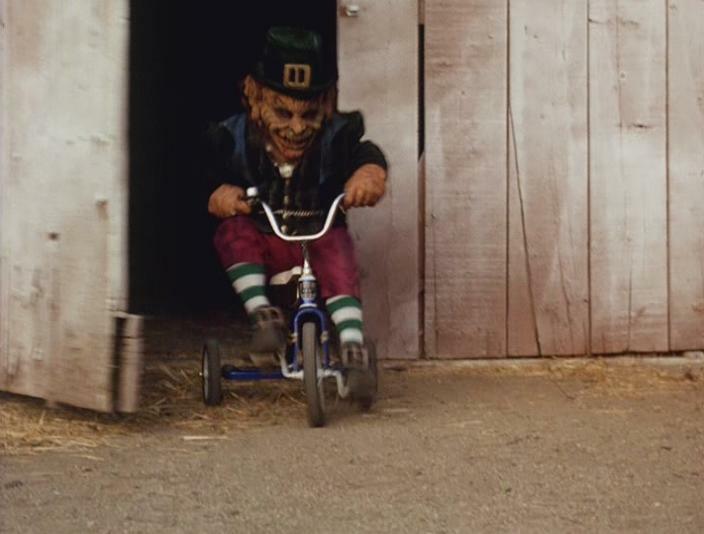 What makes Leprechaun an awkward horror comedy is what gives the film its charm. You have a demonic, pint-sized troll dressed to the nines in stereotypical old-timey Irish clothes complete with striped stockings/panterloons/whatever you want to call those leggings, who dictates goofy rhymes about killing you while giggling. He rides around in a ridiculous go kart, roller skates, a skateboard, and even a wheelchair clownishly fast. Like, “Benny Hill frame-rate speed-up” fast. Warwick Davis portrayed a sadistically playful villain in the same way that Jack Nicholson portrayed a larger version of villain as joker in Batman. That’s right, I said it. It was campy, but it fit the character, the actor seemed to be having genuine fun in the role and, at the end of it all, it made the movie. Scene of Awesomeness: I lose it every time I see the reaction of the cop who spots the leprechaun speeding down the highway in a mini-car. I don’t know if it’s the reaction or if the leprechaun is driving a car that’s half the size of himself, but I could watch that minute of film over and over again. Scene of Ridiculousness: In order to distract the leprechaun so that our heroine, Tory, can escape, the rest of the gang throw shoes. Being the OCD shoemaker demon that he is, the leprechaun is forced to run around polishing the shoes as Tory drives off and has to deal with the leprechaun by herself anyway. Actors/Actresses of Note: Jennifer Aniston somehow broke into stardom with this film. I don’t know how that happened, but I guess your star burns bright when you’re surrounded by Francis from Pee-Wee’s Big Adventure (Mark Holton) and one of the kids from Don’t Tell Mom the Babysitter’s Dead (Robert Gorman). Then there is also Warwick Davis, not so freshly off his role as the title character in Willow. Grade: A. F#*k, you, it’s an A.